Eldon Basham joined Moore Ingram Johnson & Steele in 1988 and currently serves as a partner in the firm’s Commercial Real Estate Department. He has handled all aspects of commercial closings, as well as the development of residential subdivisions from contract stage through acquisition and development. Born in Los Angeles, California, March 1, 1952, Eldon was admitted to the Georgia Bar in 1978 after receiving his B.A. from Davidson College and his J.D. from Mercer University. 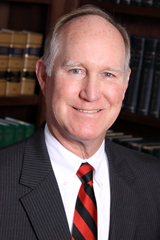 He is a member of the Cobb County Bar Association and the State Bar of Georgia. He was the 2002-2003 Chair of the Executive Committee of the Real Property Law Section of the State Bar of Georgia as well as being a member of the Bank Counsel Section of the Georgia Bankers’ Association. He also serves as City Attorney for the City of Woodstock, Georgia, as Counsel to the Cobb Galleria Centre and handles business transactions of the city and corporate clients. Eldon and his wife Paulette have one daughter, Allison, and are active members of First Presbyterian Church. They enjoy golfing and snow skiing whenever possible.